« Stone rock-solid, but Saints inspired!! Split decision for road warriors!! Some good, some bad, and, hopefully, something to build on. The Coupeville High School boys basketball squads endured an all-day trek Saturday while traveling to and from Orcas Island, finally making it back home with a split decision. The Wolf JV romped to a win to push its win/loss record up over the .500 mark, while the CHS varsity almost stormed all the way back to grab its first win, only to run out of time. After struggling to get much of an offensive show going in the first three quarters, the Wolves rang up a 22-7 run over the game’s final eight minutes. 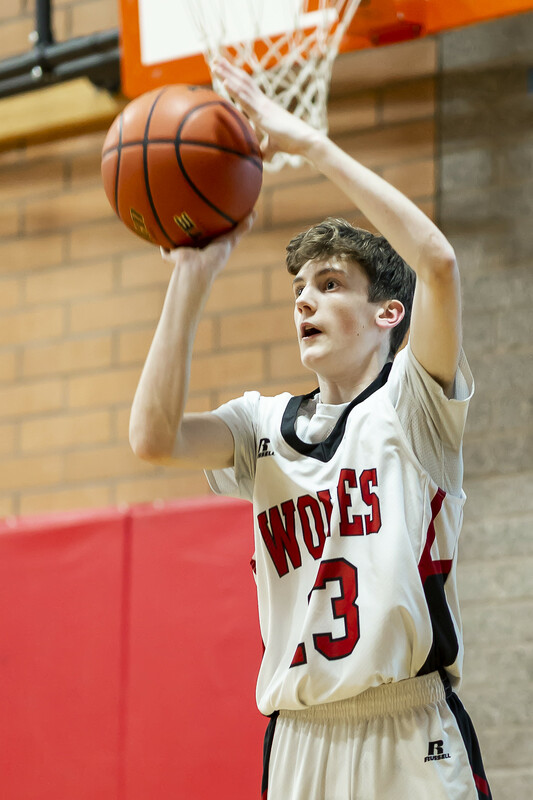 With freshman Hawthorne Wolfe scorching the nets for 12 of his game-high 18 in the fourth quarter, Coupeville cut deeply into its deficit, before falling 48-40. The non-league loss drops CHS to 0-5, with the North Sound Conference opener Tuesday at home against Sultan. Saturday, the Wolves struggled from the field in the first half, falling behind 26-8 at the break. A 10-4 first quarter stung a bit, but a 16-4 second frame was fatal. Orcas, which shot 22 more free throws than the visitors (but missed a ton of them) stretched the lead out to 23 points heading into the fourth. That was where things finally seemed to click for the Wolves, as they hit five of their eight three-balls in the final stretch. Wolfe rattled home three (he had five in the game), while Mason Grove netted both of his treys as the game wound down. As mentioned before, Orcas enjoyed a huge disparity at the free throw line, but couldn’t do much once they got there, hitting just 9-28 from the stripe. Coupeville was 4-6. Still, all the fouls hurt the Wolves, as two players fouled out and another two came within a single call of joining them permanently on the sideline. Wolfe’s 18 points are his season (and high school career) high, while Gavin Knoblich and Grove added six apiece. Knoblich’s output doubled his scoring for the year. Jered Brown added five, including a three-ball, while Ulrik Wells worked down low for three and Sean Toomey-Stout slipped a pair of free throws through the net to round out the attack. Dane Lucero, Jacobi Pilgrim and Jean Lund-Olsen rounded out the active roster. Coupeville’s second unit came out hot and never cooled off, rolling to a 39-23 win in which it outscored Orcas in every quarter. The win lifts the young guns to 3-2 on the season. Not only are they the only Wolf hoops squad with a winning record, they actually have more victories (3-2) than the other four CHS basketball teams combined. With coach Chris Smith guiding things from the bench, Coupeville powered out to a 14-9 lead after one quarter. Grady Rickner led the way in the early going, dropping three buckets in the opening frame, while Logan Martin and Daniel Olson chipped in with two baskets apiece. A unit known for letting it fly from three-point land, the Wolves settled for just a single trey, from sophomore TJ Rickner, instead draining buckets every other way. A five-point lead after one quarter became a six-point bulge at the half, then a 10-point margin after three, before finishing as a 16-point win, as Coupeville kept the pressure up. Martin paced the Wolves with a game-high 10, while the Rickner brothers combined for 17, with Grady netting nine and TJ smacking home eight. Olson (6), Tucker Hall (4) and Sage Downes (2) rounded out the scoring, with Miles Davidson, Chris Ruck and Cody Roberts also seeing floor time.